Do you want to have more time in your life. Would you like to work less and earn more? I was motivated to write this book after being repeatedly asked “how can I have your life?” Six years ago, at the age of 47, I retired with my husband who I have been blessed with as my life partner for the past 33 years. Our children had grown up and were self-sufficient, so we created the next chapter of our lives which had been a focused life goal of ours. Our magical life is now living 6 months of the year at a ski resort in B.C., Canada while sailing around the world on our sailboat the other 6 months of the year. We set sail in 2007 and we have never looked back. We did not achieve this by earning huge amounts of money, keeping our nose to the grindstone, or sacrificing the present. We achieved this by having the dream, setting the intention and living our life with purpose to accomplish it. In this book, I mention that there are always at least 3 ways to accomplish anything, but sadly most people just focus on why they can’t achieve their dream and resent those that do. • Say no to budgets! • Spend less time worrying about your finances and more time enjoying life. • Work less and bring home more, including an improved quality of life. 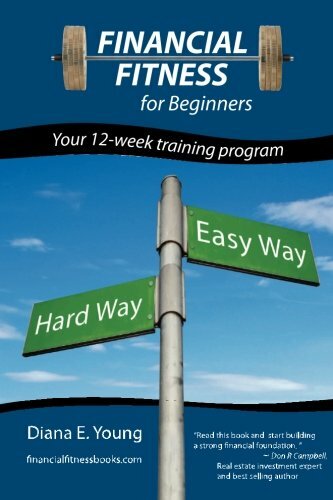 • Learn how to be financially fit – or how to get back in shape. • If you are just starting out and want to learn how to do it right, or if you are drowning in debt – feeling hopeless and overwhelmed – this book is for you! After studying many successful people, it has become crystal clear that it is impossible to have financial success without mastering personal financial management. You can buy all the real estate you want, find the winning stocks or win the lottery, but you need to be ready for it. You know that you can’t run a marathon without first getting in to shape and taking the first steps. Once you simply learn to be grateful for and manage what you now have – the doors will open for you towards having the life of your dreams. Financial Fitness is within your grasp! Diana’s book ‘Financial Fitness for Beginners’ is written in a friendly and encouraging manner to take out the mystery of personal financial management. In this step by step 12 week program, you will become the master of your own financial fitness. Learn proven tips on improving the quality of your life by eliminating debt, earning more by working less and saying no to budgets forever! Peggy McColl, New York Times best-selling author, international speaker/mentor – www.destinies.com This book is the Wealthy Barber of this decade!